Want to be notified of new releases in Atos-Research-and-Innovation/IoTagent-LoRaWAN? The Internet of Things Agent for LoRaWAN protocol enables data and commands to be exchanged between IoT devices and the NGSI interface of a context broker using the LoRaWAN protocol. It is based on the IoT Agent Node.js Library. Further general information about the FIWARE IoT Agents framework, its architecture and the common interaction model can be found in the library's GitHub repository. This project is part of FIWARE. For more information check the FIWARE Catalogue entry for the IoT Agents. 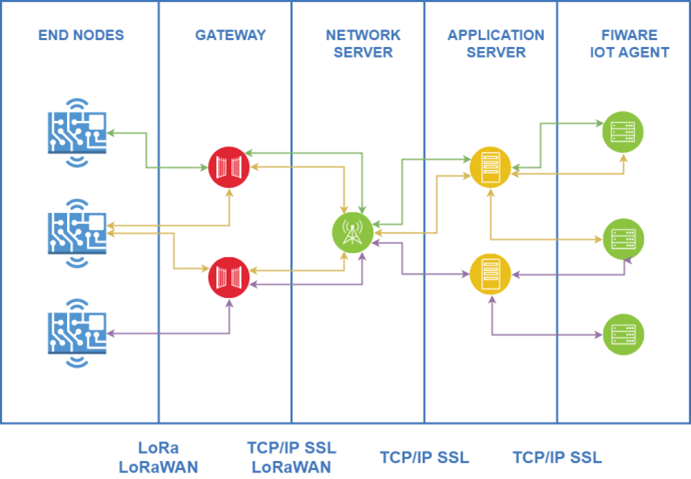 As explained in What is LoRaWAN™, the proposed Network Architecture for a LoRaWAN based system relies on a mesh network architecture composed of End nodes, Concentrators, Network Servers and Application Servers. This IoTA is fully compliant with this architecture, providing interoperability between FIWARE NGSI Context Brokers and LoRaWAN devices. Proprietary format decoded by LoRaWAN application server. Information about how to install the LoRaWAN IoT Agent can be found at the corresponding section of the Installation & Administration Guide. Information about how to use the IoT Agent can be found in the User & Programmers Manual. Apiary reference for the Configuration API can be found here. More information about IoT Agents and their APIs can be found in the IoT Agent Library documentation. FIWARE IoT Agent for LoRaWAN protocol is licensed under Affero General Public License (GPL) version 3. Are there any legal issues with AGPL 3.0? Is it safe for me to use?